IOM, the UN Migration Agency, reports that 61,517 migrants and refugees entered Europe by sea in 2018 through 12 August. This compares with 118,436 arrivals across the region through the same period last year, and 265,640 in 2016. 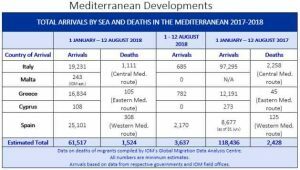 Arrivals to Spain in 2018 continue to outpace all other destinations along the littoral – with 2,170 through less than two weeks of August, or nearly the entire volume (2,476) to Spain through this date in all of 2016. 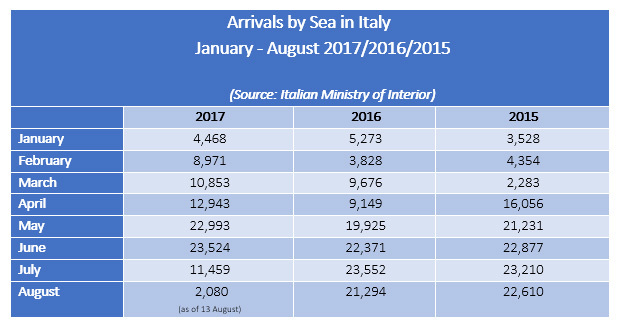 By contrast, arrivals to Italy – 19,231 through 12 August of this year – are lower than arrivals recorded during certain individual months in the years 2015-2017 (see chart below).